But that one time can make a memorable and lasting impression on life that will remain for a lifetime! I’m sure you’ve heard of the Aurora Borealis – the Northern Lights? But I wonder if you’ve ever seen them first hand. Many people who live in the viewing region of the world have seen their beauty and perhaps often, but most of us only get that opportunity on very rare occasions. They are, for the most part, a once-in-a-lifetime experience. This light show has been spotted as far south as South Dakota, Northern Illinois, and Pennsylvania – with occasional sightings in northern Indiana, but these are very rare visuals. During the week of July 15th through the 21st many of our family members were at Gitche Gumee Family Camp located on the tip of the Keweenaw Peninsula, MI (north parallel coordinate 47.468º – same as St. John’s, Newfoundland of the Canadian region of Labrador). 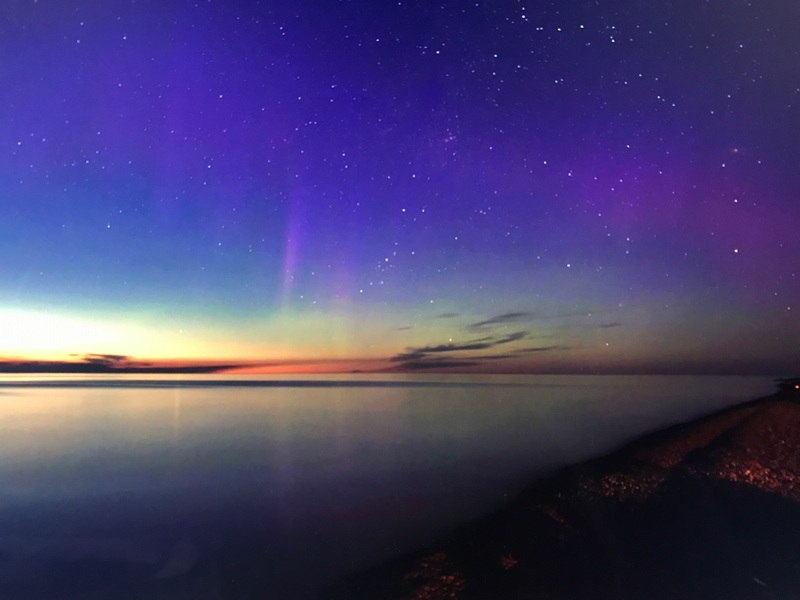 On Sunday night (the 16th) we planted ourselves on the shore of Lake Superior with anticipation of seeing this spectacular phenomenon. We were given a time frame of three hours beginning at 10:45 p.m. Not many of us were planning to stay until 2:00 a.m. but we were committed for as long as we could take the 48º temps in mid-summer attire. We stayed in place gazing into the clear skies for nearly two hours. We were astonished at the brilliance of the stars that speckled the black covering of the night over our heads watching multiple shooting stars and taking in the Milky Way! Every now and then someone would shout, “Look over there! There it is!” We would see streams of white light shooting into the sky from the horizon from the once setting sun. The picture at the top of this article shows what Eric’s camera (my oldest) picked up during one of those moments. We were thrilled to have these memorable experiences! Our glimpse of the Aurora Borealis was an experience that, while we can’t fully appreciate the wonder of all there is in this lifetime, gives us an idea of what beauty awaits us in heaven. This phenomenon was created by Jesus at the beginning of our existence for our pleasure. Even the description of the Northern Lights has some spiritual overtones – the sun interacts with the magnetic axis of the earth’s core. The Son (Jesus) creates a beauty at our very core when He is given permission to interact with our heart. God is good!